The new Beale MeasureFill faucet from American Standard allows users to preset a volume of water―from a half cup up to 5 cups—press a button, and the unit delivers it. 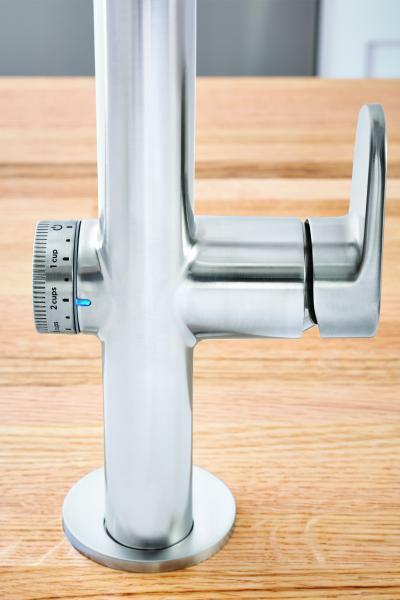 Eliminating the need for a measuring cup, the faucet is the first of its kind to hit the market, the company says. In addition to the automatic-fill function, the faucet offers touch on/off functionality so a simple of the hand or wrist on the dial window operates the unit. It also features an automatic shut-off after five minutes for safety and a temperature memory setting that allows the water to be turned off and back on in any temperature setting. Beale uses ceramic disc valves, offers two spray patterns, a flow-rate of 1.5 gallons per minute, and comes in two finishes—polished chrome and stainless steel. It uses AAA batteries or it may be outfitted with an AC adapter to make the faucet a plug-in version. The faucet will be available in April 2018. WHAT PRODUCTS ARE HOT WITH HOMEBUILDERS?